Austin Kearns Selected among "20 Greatest Dragons"
Dayton, Ohio-The Dayton Dragons today began announcing the names of the "20 Greatest Dragons" as part of the organization's 20th Season Celebration. Players selected on the list of 20 will be announced in random order leading up to the Dragons 20th Opening Night game on Thursday, April 4 against the Bowling Green Hot Rods. 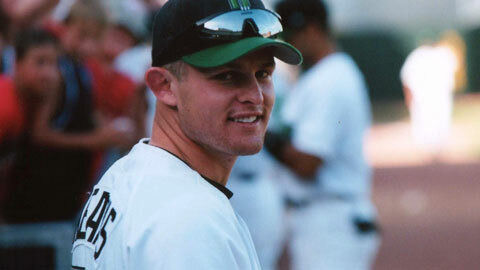 Kearns was on the field for the first Dragons game ever played in 2000 and spent the entire season with the club. As a Dragons player, he is best remembered for his amazing streak of eight consecutive games with at least one home run from July 17-24, 2000. During the eight games, Kearns went 18 for 25 (.720) with 10 home runs, 20 runs batted in, 19 runs scored, and 10 walks. Kearns' home run streak ended two short of the all-time Minor League record set in 1928. Kearns was selected as the Midwest League's Co-Prospect of the Year in 2000, sharing the honor with Albert Pujols of Peoria. Kearns went on to enjoy a 12-year Major League career from 2002-2013. In his first full month in the Major Leagues, he was selected as the National League's Rookie of the Month in May of 2002. Kearns was third in the N.L. Rookie of the Year voting in 2002 with the Reds when he batted .315 with 13 home runs in 107 games, posting a .907 OPS. He established career-highs in home runs (24) and runs batted in (86) with the Reds in 2006. Kearns also played for the Nationals, Indians, Yankees, and Marlins, appearing in 1,125 MLB games. He hit 121 big league home runs. Ticket information for the Dragons 20th Season Celebration Game: Dragons season ticket holders have received information via email. All fans can go to DaytonDragons.com/CelebrationGame for more ticket information and to add their name to the ticket waitlist. Single-game ticket sales will begin in mid-February.